What is Swarm and what is it used for? What is Swarm and what is it used for? And what is Swarm's relationship with Whisper? More specifically, Swarm is being designed as an accounting protocol that benefits from the automatic execution of so-called "smart contracts" running on the Ethereum Virtual Machine (EVM). This accounting protocol is independent of the physical storage mechanism. That is, it is not intrinsically tied to a specific storage system. It could be IPFS, BitTorrent, or some future technology not yet invented. 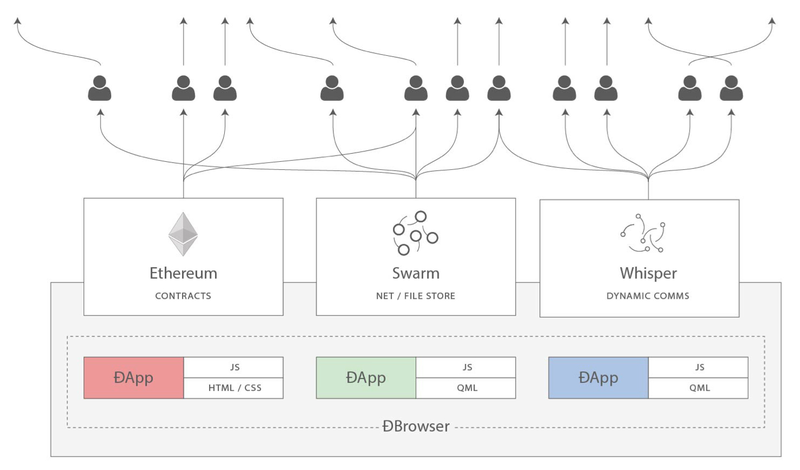 It is not entirely clear where Swarm and Whisper fit into the development roadmap and when or if they will be delivered by the same developers that developed the EVM, however it is part of the vision of a fully decentralized web. Not the answer you're looking for? Browse other questions tagged storage whisper swarm hosting bzz or ask your own question. Are Whisper and Swarm still being developed? How to list all the contracts currently on the blockchain? Syncing filled all my space, where is the data and how do I remove everything as clean as possible? What is the difference between Swarm and IPFS? How to access files hosted on swarm? How does one enable and use SWARM demon & Whisper messaging functionality provided by Geth 1.5? What are the differences between the incentivisation systems for Swarm, IPFS and STORJ? What does it mean Ethereum Swarm account?